GeNeTX™ technology gives you the ability to "warp" the characteristics of any 2 amp and cabinet models into a completely new "Hypermodel." Now you have the ability to create an entirely new amp/cabinet combination that is uniquely your own. To make this incredible tone shaping power even more flexible we have included Distortion Stompbox modeling. 10 of the most popular distortion stompboxes can be used in conjunction with any of the models and hypermodels, making the GNX2™ the most complete guitar processing system to date. For individuals into digital recording, the GNX2™ provides an S/PDIF digital output allowing direct connectivity to these devices. You may no longer need outboard effects processing with an extensive library of studio quality effects including the Talker™, giving your guitar the ability to literally "say" what's on its mind. 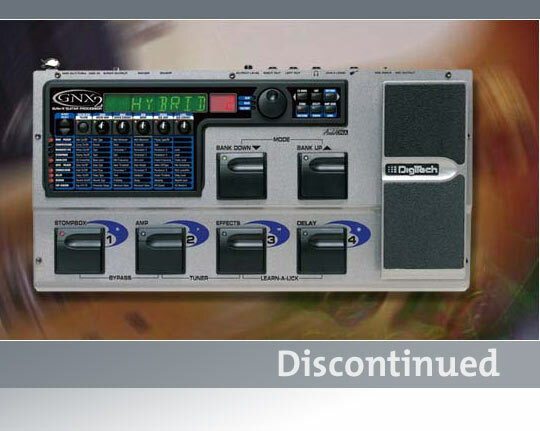 The GNX2™ has 64 user and 64 factory presets as well as Learn-A-Lick™ and Rhythm Trainer practice tools. Signal to Noise Ratio > 97dB; ref = max signal, 22kHz measurement bandwidth. Dimensions Length 17.5" Width 9" Height 3"
How do I connect my GNX through the effects loop of my amp if I only want to use effects and not amp modeling? To connect via effects loop, connect the send of the loop to he guitar input of the GNX, and connect the left 1/4 inch output of the GNX to the return of the amp. Next, select a preset on the GNX, and in that preset put the amp model and the cabinet model on DIRECT. Press the Utility Button, go to the target system, and put that on DIRECT or FX4x12. Next, press the MODE switch until it is lit yellow. In this mode, your numbered footswitches will act as on/off switches for the various effects written above them such as delay. You will still need to go into the preset and adjust the effect the way you want, such as chorus speed or depth.